Based on current production predictions of 21,000 cars this year, and up to 40,000 by 2015, it's possible Tesla could use the entire global supply of 18650 model LiOn batteries for its Model S sedans. Sure, there's way more laptops sold with those batteries, but every Model S with the 85 kWh battery pack uses over 7,000 of the cells. The Model S uses about 2,000 times as many cells as a normal laptop battery, and those cells are commodity 18650 cylindrical cells. 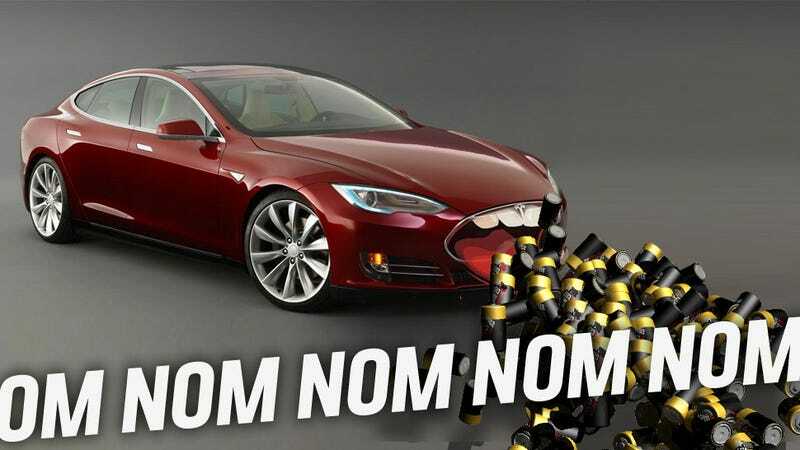 Yep, that means if you had the time and resources to pull apart a Model S, you'd end up with a garage full of little cylindrical cells, like the Model S was a giant R/C car using thousands of AAAs. If Tesla does manage to ramp production up to the 40,000 cars/year that they're planning, that would require the entire current output of 18650 LiOn cells to supply them. So what's going to happen? Well, things will have to scale up, clearly. Panasonic, a Tesla investor and partner, has already started planning increasing capacity by re-opening old lines and starting up new ones. Tesla has made by far the biggest impact on the battery industry of any non-computer/electronics manufacturer, and it's looking like they may become the dominant customer very soon. Tesla's success took the battery industry somewhat by surprise, and if Tesla's growth plans are to be realized, there's lots more growing that's going to be needed from the industry, and soon.